The real estate market experienced a volatile year. The market was quite quiet in the second half of 2018; however, the overall picture of the 2018 market has many investors optimistic for 2019. According to experts, the market will likely encounter hardships in land fund, capital and administrative procedures, but investors will still find ample opportunities. Mr. Nguyen Tran Nam, Chairman of the Vietnam Real Estate Association, said, in 2018, the property markets in Hanoi and Ho Chi Minh City, two major cities of Vietnam, were quite stable and sustainable. Many projects continued to be invested strongly to ensure the schedule. Only in the third quarter of 2018, Hanoi and Ho Chi Minh City launched 20,328 new products whose prices were quite steady. 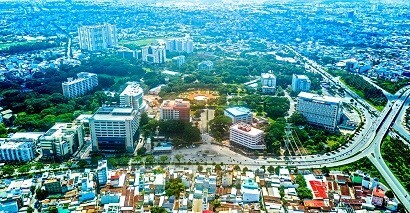 Remarking on the real estate market in 2018, Dr. Tran Dinh Thien, former Director of the Vietnam Institute of Economics, member of the Prime Minister's Economic Advisory Team, gave 10 brief remarks seen as major influencing factors on the real estate market in 2018: (1) Land price bubble in expected ‘special zones’ of Van Don, Van Phong and Phu Quoc; (2) Fire of Carina Apartment in Ho Chi Minh City resulting in a series of policy changes; (3) Land price surges in suburban areas of ​​Ho Chi Minh City and Da Nang City; (4) The rise of office segment; (5) Commitment to build smart urban areas by 28 localities; (6) The opening of the first International Conference on Real Estate in Vietnam; (7) Strong FDI inflows into real estate; (8) Many policies on condotel and officetel debated; (9) Decree 20 on upper limit on lending interest rates; and (10) Construction of high-rise buildings restricted in the downtown of Hanoi and Ho Chi Minh City. In 2019, the property market will encounter numerous difficulties, with the biggest impact being global economic instability fueled by the ongoing U.S.-China trade war. Besides, the United States Federal Reserve (Fed)’s plan to raise interest rates may greatly affect the world economy in general and the Vietnamese economy in particular. For that reason, the fund for project development will not abundant in 2019. According to Mr. Nguyen Tran Nam, in 2018, the credit growth was capped just 14% by the State Bank of Vietnam (SBV), much lower than 17 - 18% in previous years. By June 2018, many banks reportedly ran out of room for credit growth. Furthermore, according to the approved roadmap, short-term deposit sources for medium-term and long-term loans at local banks, foreign banks and credit institutions will gradually decrease. The SBV also requested commercial banks to strictly control credit growth and limit lending to risk-prone areas such as real estate and securities while also raising the loan risk ratio for real estate from 150% to 200%. The above moves will inhibit real estate companies from accessing bank loans. Mr. Truong Anh Tu, Business Director of Phuc Khang Corporation, said, Ho Chi Minh City is currently limiting apartment construction in downtown and in the places where infrastructure is not synchronously developed. This will make many projects built in infrastructure-overloaded places unsellable. Determining future supplies remains in question. There are still many factors that affect the market supply in 2019 - 2020. Mr. Tran Kim Chung, Vice Chairman of the Central Institute for Economic Management (CIEM), said that the real estate market in 2019 will be affected by three bottlenecks seen in 2018. Firstly, institutionally, Vietnam is integrating more and more deeply into the world and the Fourth Industrial Revolution is exerting stronger impacts on economic and social life. Hence, financing expansion is essential and this needs an institution for operation, for example creating an institutional framework for condotel, investment funds, mutual funds, and other investment forms. Secondly, in 2018 and 2019, we have not seen any financial policies for the real estate market. Particularly, trust funds are the best possible solution for the real estate market but are yet to be launched. Thirdly, market actors need to engage deeper. We need to open the door but we need to control it. For example, as foreign cash may flow in endlessly, we must know how much is enough. In 2018, we managed to apply it and we must have proper control in 2019. Mr. Nguyen Van Dinh, Deputy Secretary General of the Vietnam Real Estate Association, said, in 2019, the real estate market will have stable indicators and better growth, evenly distributed among segments. The affordable housing segment has a very high demand. Affordable housing cannot be built in the downtown but in suburban areas. In fact, infrastructure, utilities and services in these places are inadequate and insufficient. “With VND2 billion (US$87,000), I recommend you buy an apartment in Hanoi or Ho Chi Minh City because the price is not likely to rise much,” he added. Speculators have now shifted to strongly growing segments because the chance for price spikes is high, he explained. As regards residential land, buyers should not take land of unclear legality. They should buy in fast-expanding markets and in places with complete infrastructure. In addition, vacation property has high potential. Vietnam has a lot of advantages in landscape, climate and food. As our market is just developed, there is much room for profitable investment. Condotel in Vietnam is now cheap relative to other countries in the region. Mr. Le Hoang Chau, Chairman of the Ho Chi Minh City Real Estate Association, the bad scenario of real estate in 2019 is getting clearer as the market supply has declined for many consecutive quarters and successful deals have also dropped over 2017. The supply of affordable apartments has plunged most, with some places witnessing a nearly 70% slump. To buy property for profit, the safest option is a flat with one or two bedrooms in well-connected places. The demand and liquidity of this segment is always high.